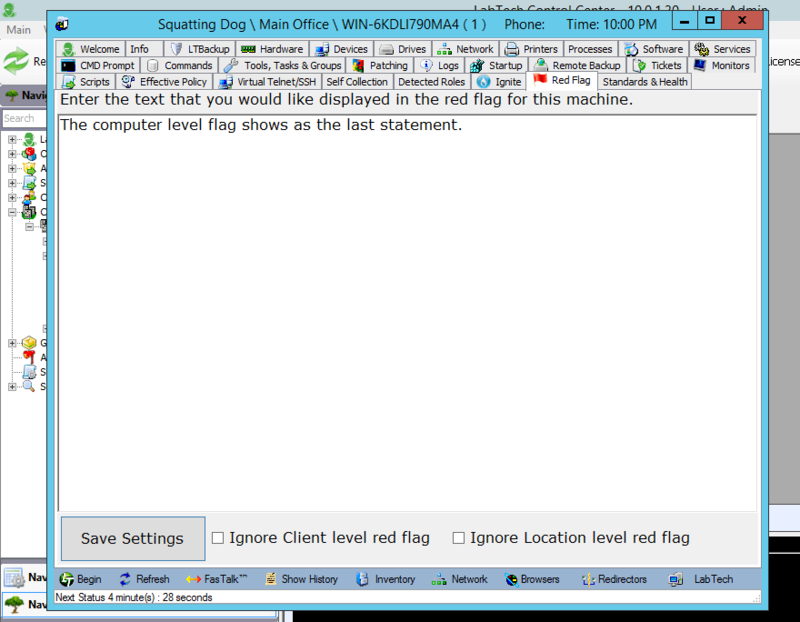 The red flag feature in ConnectWise seems to be a great way to relay client level information to engineers without them having to hunt it down or remember it. But this feature is missing from LabTech – until now. This plugin will allow you to have client, location and computer level information show up any time you open up the computer window. And if the computer is an exception, you can set it to ignore the client/location level flags. As soon as you open the window, you’re prompted with the information, and it’s also readily available by clicking the red flag next to the computer name in the Welcome tab. It’s easy to update the flags and make sure everyone is aware of important pieces of information when working on a computer. Feature request update: As requested by a user, you can now allow users to edit the flag based on their user class. Add the class ‘RedFlag Editor’ to their permissions and they’ll be able to edit the client, location and computer specific flag. Note that this does require you to update first via the plugin installer. New: This plugin now supports LT11, HTML, and automatic updates! Also new: Bulk flag viewer/editor! Download and install using the plugin installer! This is an awesome idea !! Can’t wait to try it out. Location & Client level red flags only seem to work after I hit the save settings on an agent (once). Is that something that can be easily fixed? Got that fixed. Please redownload and update! Would it also be possible to have this info in or when you open a ticket that’s linked to a client? I’ll see if I can make that happen. Good idea! I installed this plugin yesterday and it’s been great ! Great Idea ! The only issue I ran into was, it seems like everyone has full access to this plugin regardless of permission restrictions on LT. I logged in as one of my clients who has very minimal access on the control center, and I can configure Red Flag plugin to write whatever I want. Is there anyway we can control permissions for this plugin? Thanks a million ! I’ll see what can be done. Without over complicating permissions, I may have it read only for non-admins and then allow only admins to write. Expect an update in a couple of days, and thanks for the feedback! Awesome ! May I suggest the same thing for the Operators Dashboard as well? That plugin has the same issue where everyone has every access to that plugin. I can post the feedback on that page if you would like 🙂 Again, thanks for sharing these awesome tools. They make our lives so much easier ! Just wanted to update you to let you know that this plugin now has permission checks in place. Only Super Admins can edit the red flag information, but everyone can see it. You’ll need to update the plugin for this to work. Do so from http://squattingdog.net/plugininstaller/. I updated the plugin but still do not see class ‘RedFlag Editor’ under permissions, so my techs are still unable to set red flags. I don’t want them to be Super admins in the system and checking off allow plugin under effective permissions does not do a thing. Looking at the plugin version i am running 0.81. The plugin is great and i am finally getting the buy in from the team here to start putting in notes for troubling servers. I’m glad you’re finding this useful. The plugin doesn’t actually create the user class, it just uses it. You will need to create the user class, but it doesn’t need any additional permissions. Assign the class to the desired users and they can then edit flags. Does this work on LT12 or 2019.1? It does indeed work. Only non-working part is that the red flag doesn’t show up on the dashboard of the computer window as it did with old computer window. But the prompt still works as expected, including from client/location/computer level.